Lakshmi N Mittal would become the President of the new steel giant Arcelor-Mittal, while Arcelor’s current Chairman Joseph Kinsch would continue to be in the position till his retirement. The Planning Commission has warned that the rising oil prices could retard the country’s growth by up to 1 per cent and suggested that the government would have to re-orient appropriate monetary and fiscal policies to offset the same. A large number of IT, ITES, telecom and banking companies in India are finding it difficult to recruit and retain the skilled manpower. Outbidding Chinese, Malaysian and other Indian companies, BHEL has won a major contract worth Rs 55 crore from Power Grid Company of Bangladesh for setting up 230-kv substations for an ADB-funded project. “This is the first order for BHEL for substations in Bangladesh,” said a company spokesman here today. 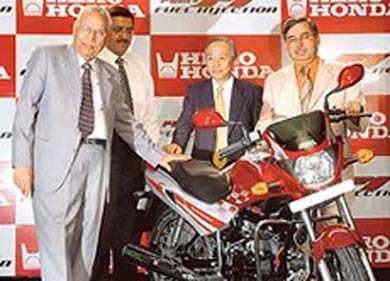 Mr Brij Mohan Lal Munjal, Chairman of Hero Honda Group; Mr Anil Dua, Vice-President, Marketing; Mr T. Nakagava, Joint MD, and Mr Pawan Munjal, MD, at the launch of India’s first fuel-injection motor cycle, Glamour Fi, in New Delhi on Monday. The motor cycle is priced between Rs 49,990 and Rs 53,990. Mr Pawan Munjal said the company was not contemplating raising prices despite pressure on margins due to higher costs of inputs. Former Miss World Yuktaa Mookhey launches EMR (electro magnetic radiations) solution products at a press conference in New Delhi on Monday. Introduced for the first time in India, the products include radiation-safe mobile phone covers with multi-speciality radiation shields, e-safe stickers, e-safe pocket inserts and radiation safe aprons. Union Petroleum Minister Murli Deora today announced that the Indian Oil Corporation (IOC) would set up a liquefied natural gas (LNG) terminal at Ennore port here. Mobile and fixed phone subscribers can expect a reduction in tariffs with the Department of Telecom gearing up to effect the annual licence fee cut to six per cent from the current circle-based fee of up to 10 per cent after the Monsoon Session of Parliament. Moscow has eclipsed Tokyo as the world’s most expensive city, a new survey says. A spices and masala manufacturing company from Erode shared the stage with corporate giant Hindustan Lever and six others as they bagged The Energy and Resources Institute (TERI) awards today in recognition of excellence in environmental protection and for fulfilling social responsibility. Getting a windfall following a sharp rise in international crude oil, the ONGC has posted an increase of 11 per cent in net profit at Rs 14,431 crore in 2005-06 as against Rs 12,983 crore in previous fiscal. “Initially, the Chairman position will be held by Kinsch and the President position will be held by Mittal. Upon the retirement of Kinsch, Mittal will assume the role of Chairman and the successor to the President will be proposed by Kinsch,” Mittal Steel said in a statement. For a period of three years, the agenda of each Board of Directors meeting shall be jointly agreed by the Chairman and the President of the company and shall include any matters proposed to be included on the agenda jointly by them. “For a period of three years, the Mittal family shall vote in shareholders’ meeting in accordance with the position expressed by the company Board of Directors, unless Mittal opposes any such decision, in which case the Mittal family shall have the right to vote at such meeting as it sees fit,” Mittal Steel said. Mittal family has also agreed to a standstill at its level of ownership following completion of the revised offer and any subsequent offer or compulsory buy-out, or at a ceiling of 45 per cent of the then issued company shares if and when the Mittal family’s holding falls below 45 per cent. “The Mittal family will be entitled to cross such thresholds in certain circumstances, such as with the consent of a majority of the independent directors or in case of passive crossing of such thresholds,” Mittal Steel said. According to the agreement between the two companies, “Each initial Board of Directors will be composed of 18 non-executive members, the majority of whom will be independent. Six members will be nominated by Mittal Steel, three of whom will be independent”. “Six members will be from the existing Arcelor Board. Three members will be from the Arcelor Board representing existing Arcelor major shareholders. 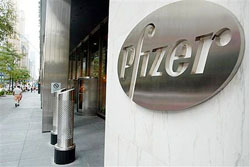 A further three members will be employee representatives,” the statement said. MOSCOW: In a development that could potentially stir up trouble for the mega Arcelor-Mittal deal, Russia’s Severstal has announced it would improve its bid for the Luxembourg-based steel giant, whose board yesterday dumped it for a tie-up with Mittal. The slighted former suitor, with whom Arcelor had entered into a strategic tie-up on May 26, was cut up that its representatives were not invited to attend Sunday’s Board meeting. Severstal said it had an agreement to merge that ties up to the Board of Arcelor and was surprised that no discussion was held with them over the revised offer (from Mittal) and no opportunity given to respond. Severstal said it was going to improve its bid ahead of the June 30 meeting of Arcelor shareholders. According to a Russian daily Izvestia, Alexei Mordashov, who controls Severstal, has forged an alliance with Roman Abramovich, the owner of UK-based football club Chelsea, to offer a higher price for Arcelor shares. ABN AMRO Bank has also reportedly offered the required money to the Rusian steel-maker. Meanwhile, exuding confidence that Arcelor shareholders would support his company’s takeover bid, Mittal Steel chief L.N. Mittal said Severstal had the option of increasing the bid for the entire company and not part of it. “Simulations with macro-models suggest that if oil prices increase sharply in future, our growth rate could be lowered between 0.5 per cent and 1 per cent below the levels projected with the present levels of oil prices,” the commission observed in the draft approach paper to the 11th Plan. Stating that all such estimates had a large margin of error, the plan panel said even these simulations show that with appropriate oil pricing policies, increased exports and appropriate fiscal and monetary policies, the adverse impact of high oil prices on GDP growth could be substantially moderated in the medium term. These measures would have an impact on affordable levels of consumption but they need not have as sharp an impact on GDP growth, it observed. It is difficult to predict what would happen to oil prices in the next five year period but current assessment suggests that oil prices would remain high, the plan panel said and pointed out that this would exert pressure on the economy, both directly and also through their impact on world economic growth. “The impact of high oil prices on the world economy is somewhat muted thus far partly because industrialised countries have been more able to adjust to higher oil prices but, as pointed out above, there are macro-imbalances in the world economy which make it vulnerable,” the commission observed. A large number of IT, ITES, telecom and banking companies in India are finding it difficult to recruit and retain the skilled manpower. BPOs and Contact centres are using attractive salaries to retain their employees. “India reported the highest average salary increase at 13.9 per cent, and employees in the Indian IT-enabled industry received the highest increase across all five groups surveyed at 17.9 per cent,” said Ms Achal Khanna, Country General Manager, Kelly Services for India, while releasing the India Salary Guide 2006 here today. Following buoyancy in the IT and telecom sector, recruitment by organisations will continue for the rest of 2006 but there is increasingly unmatched demand for emerging skill sets, it said. 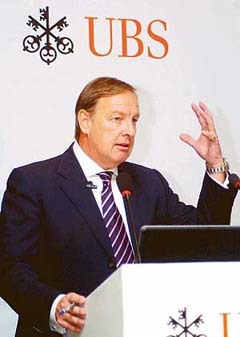 Based on information and trend data collected from the specialised operation units, and experience from dealings with the clients, both local and MNCs, Kelly Services, the global provider of staffing services and solutions, said that with a major boost in construction and manufacturing, high automobiles sales, and higher consumer spending, the overall recruitment outlook has been very encouraging. This has been reflected in the salaries and demand for talent. India’s software companies are expected to create 2.3 million jobs by 2010 and an additional 6.5 million indirectly, it said. With huge demand in the offering, salaries are bound to go north. The Kelly Services 2006 Salary Guide showed that there was a strong demand in the banking industry for entry-level positions. The call centre industry is showing a greater employee churn and calling for organisations in this business sector to use attractive means to retain talent. Based on the findings of the latest India Salary Guide 2006, with the splurge of malls, residential areas and corporate offices across the country, there has been a major rise in the demand for managers, officers, engineers and technicians. IT, ITES, telecom, pharma are leading the pack when it comes to high salaries and instant job offers going through. The majority of companies in these sectors are in expanding mode and they need talent to support this expansion. BHEL’s scope of work in the project includes design, supply, erection, civil construction and commissioning of the substation at Baghabari and expansion of Ishurdi substation. Earlier, BHEL had successfully executed several contracts in Bangladesh, including the turn-key execution of a 100-MW gas turbine-based power plant at Baghabari. During the past financial year (2005-06), BHEL registered the highest-ever physical export orders of Rs 3,348 crore— a six-fold increase over the previous year. For the first time, export orders contributed 18 per cent to the companys total order booking during 2005-06. Speaking at a function to dedicate the Chennai-Tiruchi- Madurai petroleum product pipeline of the IOC here, he said the IOC was seized of the proposal to set up the terminal of 2.5 MMTPA capacity with the provision for expansion to 5 MMTPA. The techno-commercial feasibility study had been completed and suitable land adjacent to the Ennore Port had already been identified. “However, due to a difficult supply situation of LNG in the international market, the IOC is still making all-out efforts to achieve a reliable supply of gas,’’ he added. The department is preparing a roadmap to cut the current circle-based licensing systems to a uniform 6 per cent, which currently stands at 10, 8 and 6 per cent for A, B and C circles, respectively. The cut will be effective after the monsoon session of Parliament, senior DoT officials said. The Russian capital moved up three spots from a year ago thanks to a recent property boom, according to a survey released today, while the Japanese capital slipped to third place due to the weaker yen. South Korea’s Seoul ranked second on the list, up from fifth last year. The survey by Mercer Human Resource Consulting ranked 144 cities around the world, measuring the comparative cost of more than 200 items such as housing, transportation and food. The survey is aimed at helping multinational employers determine compensation for their expatriate workers. With cities around the world getting increasingly expensive for expatriates — notably cities in developing countries — employers may need to re-examine the way they provide compensation and benefits for their workers, said Rebecca Powers, a senior consultant at Mercer. “As we see more and more movement into these emerging markets, a lot of those programmes need to be looked at,” Powers said. Overall, foreign exchange rate fluctuations were behind the majority of the changes in ranking, but in Moscow’s case, costs were buoyed by the surging price for large living accommodations. Prices for big houses rose some 50 per cent over the past year, driven in large part by soaring demand from expatriates, Powers said. President A.P.J. Abdul Kalam gave away the awards. While Sakthi Masala Ltd from Erode, Tamil Nadu, was honoured for its unique recruitment policy whereby 1/3rd of its workforce today is differently-abled men and women, HLL got the prize for marketing under the brand name ‘Vindhya Valley’ papad, pickle and other food products manufactured by village women in Madhya Pradesh. It is despite the fact that ONGC crude oil production logged 24.4 million tonnes (MT) in 2005-06, down by 8 per cent from 26.48 MT in FY 05, mainly due to disruption of production from Bombay High. The company also had to shell out Rs 11,956 crore in trade discounts to the oil marketing companies following government directions, thus impacting its net profit by Rs 7,10 crore. ONGC Chairman and Managing Director R.S. Sharma declared the highest-ever dividend of 450 per cent amounting to Rs 6,417 crore to the shareholders. The company has already paid 250 per cent dividend. The group turnover on gross basis adds up to Rs 74,312 crore, higher by 19 per cent against the previous year of Rs 62,224 crore. The anticipated net profit of the group companies adds up to Rs 15,398 crore, up by 5.9 per cent from last year’s Rs 14,339 crore. Mr Sharma said net worth of the corporation was up 22 per cent from Rs 48,058 crore in the past fiscal to Rs 58,782 crore in 2005-06. The ONGC also achieved the highest-ever-earning per share (EPS) of Rs 101.20 an increase of 11 per cent at RS 91.05 crore in FY05. Mr Sharma said capital expenditure rose to Rs 11,421 crore up by 7 per cent from Rs 10,681 crore in Fy05. He said out of this 99.7 per cent was spent on exploration and production (E and P). He said natural gas production was maintained at 22.57 billion cubic metres (bcm) and its sales was 18.23 bcm compared to 18.52 bcm in FY 05. While Mangalore Refinery and Petrochemicals ltd, an ONGC group company posted a 37 per cent increase in its turnover at Rs 28,243 crore. However its profits went down by 58 per cent at Rs 372 crore from last year’s profit of Rs 880 crore on account of oil marketing companies deciding to deviate from agreed refinery Gate Price Formula and thereby forcing discounts on invoiced prices. TVS Motor Company Ltd today recorded a 39.29 per cent dip in net profit at Rs 29.09 crore for the quarter ended March 31 as compared to Rs 47.92 crore for the same quarter in 2004-05. However, the total income rose by 11.71 per cent to Rs 860.62 crore for the fourth quarter in 2005-06 from Rs 770.39 crore in the year-ago period, the company said. The Board has declared a second interim dividend of Re 0.60 per equity share of Re 1 each (60 per cent) for the year ended March 31. Together with the first interim dividend of Re 0.70 per share (70 per cent), which was paid to the shareholders in November last year, the aggregate of interim dividend declared for the year ended March 31, 2006, is 130 per cent. For the year ended March 31 the company registered a net profit of Rs 117 crore as against Rs 137.57 crore for the year 2004-05. The total income stood at Rs 3305.96 crore in FY 05-06 as compared to Rs 2955.21 crore during FY 04-05. The group posted a consolidated net profit of Rs 110.47 crore for the year ended March 31, where as the same was at Rs 136.61 crore for FY 04-05.